Fork Truck Free (FTF) reduces inventory costs in the supply chain. This fact is why cart delivery demand is greater than ever and the focus at ProMat 2019 in two weeks. Break the chain down into its essential elements, and manufacturers see ways to make it work more efficiently. From improving space utilization, industrial companies relying on the status quo spend more money to keep supplies and inventory in a warehouse. The use of multiple suppliers, moving supplies faster, along with reviewing customer demand patterns frequently, allow for a streamlined ordering lineside delivery process. Lean Manufacturing’s principle of continuous process improvement allows manufacturers to reach desired amounts of inventory costs. Some of the frequent strategies include avoiding minimum order quantities, reorder points, an organization warehouse or plant floor, elimination of obsolete stock, and of course, implementing just-in-time inventory systems. As levels of supply chain integration have increased and inventory levels have been reduced, reliable, on-time deliveries have become increasingly critical for success. Large inventories and production capacities were traditionally required to ensure on-time delivery. However, with advanced information systems, deregulation, agile manufacturing organizations with flexible equipment and tooling, and sophisticated logistics systems, integrated supply chains no longer need large, costly inventory buffers to respond to unexpected events and variations in demand. Manufacturing supply chains can benefit from integration with logistics providers/carriers, many of whom offer services that can reduce supply chain costs and increase overall performance. Reduced transportation costs, shorter in-transit times, and value-added services can be major factors in improving the competitive position of the supply chain. In today’s global manufacturing these factors become critical, including shorter product cycles, e-commerce, just-in-time manufacturing, mass customization, reduced inventories (especially of high-technology products that can rapidly become obsolete), and global sourcing and selling. In warehouse or a typical logistics operation, inventory costs are around 20 to 30 percent of the total budget. That means for every $1 million in products stored, companies are paying $200,000 to $300,000 to store them in a warehouse and move them in and out of inventory. Cost reduction in inventory management is vital in an exploding market that is continuously attracting more competition. One report predicts that the logistics market will surge from around $10 trillion in 2019 to more than $20 trillion in 2026. Inventory management is incredibly important to business’s bottom line. Lineside industrial cart delivery reduces inventory management. Doing nothing is simply too expensive. 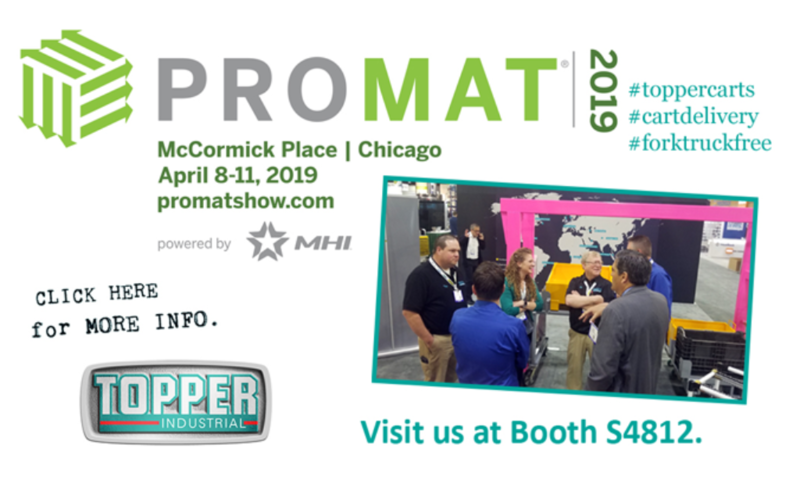 Topper Industrial is exhibiting at ProMat in Chicago at Booth #S4812 from April 8 – 11, 2019. Topper Industrial education session is titled, “Why is Cart Delivery in High Demand?” in Theater I at 1:30 pm on Tuesday, April 9, 2019 and repeated on Wednesday, April 10, 2019 at 10:30 am in Theater E. Visit our booth at ProMat. Next post New Video Upload - Topper Industrial Tilt Cart for Line Side Delivery of Materials.